Technically, acorns, chestnuts and hazelnuts are the only "true" nuts. Almonds, brazils, cashews, macadamias, peanuts, pecans, pinenuts, pistachios and walnuts are "seeds". The term "nut" has now been broadened to include the seeds. Nuts are the edible fruit from trees or bushes that are enclosed in a shell, of varying degrees of hardness, which serves as a protective coating from predators. Inside the shell of each nut is one edible kernel. The outer skin of the nuts is usually bitter but can be removed by blanching or toasting. Toasting the nuts in the oven also enhances the nut's buttery flavor and gives them a golden color with added crunch. To toast the nuts, spread on a baking sheet and bake in a 350 degree F (180 degree C) oven for anywhere between 8-20 minutes. The nuts are done when they are light golden-brown in color and fragrant. The baking time depends on the type and size of the nut. Nuts can be toasted in advance and stored at room temperature in airtight containers or plastic bags for up to a week. 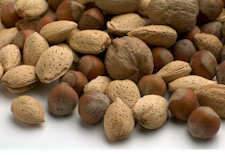 Nuts are sold in various forms: shelled and unshelled; raw, toasted, toasted and salted, smoked, candied and with various flavorings. Nuts also come whole, chopped, or ground. When buying unshelled nuts look for nuts that are smooth and unblemished, heavy for their size, and do not rattle when shaken (except for peanuts), as rattling indicates the nutmeat is old. Shelled nuts should be uniform in color and size, and plump looking. Discolored or shriveled nuts means they are old. Always buy nuts from a place where you know there is a high turnover rate. Most nuts are at their best in the fall, when they are harvested. Nuts are high in fat and natural oils which causes them to turn rancid quickly. Store unshelled nuts in a cool dry place for up to 6 months. Shelled nuts are best stored in the refrigerator or freezer in airtight containers or plastic bags. Some products made from nuts are flours, nut butters, pastes and oils. Nuts contain a high percentage of fats, mostly monounsaturated and polyunsaturated. TIP: Toasted nuts are less likely to sink in cakes, quick breads and other baking. Another way to stop nuts from sinking in batters is to take 1-2 tablespoons (10-20 grams) of flour called for in the recipe and toss the nuts in it. TIP: Warm nuts are easier to chop. TIP: When a recipe calls for "coarsely" chopped nuts, cut into large pea-size pieces. TIP: Freshly shelled nuts have the best flavor but for convenience shelled canned nuts can be used. TIP: Unsalted nuts have a longer shelf life than salted ones. TIP: Chopping nuts by hand ensures uniformity as opposed to using a food processor. TIP: If you have bits and pieces of shell in your shelled nuts, place the nuts in a large bowl of cold water. The shells will float to the surface and can be skimmed off.